The epic Ruta 40 runs alongside the Andes for over 5000km in total. This expedition takes in everything from hanging glaciers to ancient cave paintings and gives you the chance to try horse trekking from remote estancias or rafting on the river Futaleufu, all in a fantastic area that too many people only pass through. Departing from Bariloche, located in the heart of Argentina's Lakes District, we head south and cross the mighty Futaleufu River into Chiles remote southern region, the Carretera Austral. Cross into Chile and hit the Carretera Austral 'Southern Road', with a reputation as South America's best road trip. The Carretera Austral (Southern Road) is a remote, unspoiled region of intense natural beauty and is often referred to as one of South America's best road trips. Note: This tour begins with departure from Bariloche, as such we recommend a minimum of one night pre tour accommodation in Bariloche before beginning the tour. This tour also connects with our Lakes District Discovery expedition that starts in Santiago and ends in Bariloche. We continue along the picturesque Carretera Austral stopping along the way to take photos and admire the spectacular natural vistas. Wild rivers flow through lush forests, rolling hills give way to snow-capped mountains, waterfalls tumble along steep cliff faces, and the world is reflected in mirror like lakes. At lunch time will arrive at the coastal fishing village of Puyuhuapi, located on the edge of the Chilean Fiords in a setting of incomparable beauty. Tonight we will spend the night in a lodge located on the edge of the Chilean Fjords. 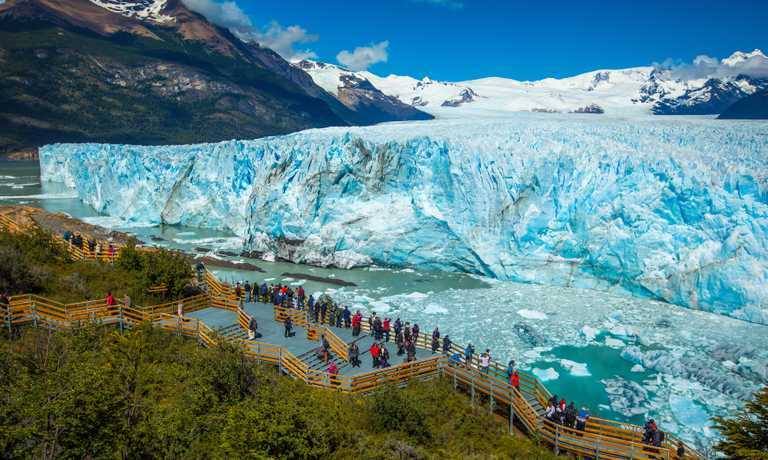 Take the rare opportunity to get up close and personal to a spectacular hanging glacier in the Queulat National Park. Nature at its finest! We will take a hike to get close to the spectacular Hanging Glacier which is the magnificent centerpiece of the park. Enjoy being surrounded by virgin evergreen forests made up by species like coihue, tepa, tepuala, and Chilean rhubarbs. After lunch hike to a nearby waterfall, grab a line from the lodge and try your hand at fishing on the edge of the fiords or simply sit and be surrounded by nature. Hike in the beautiful and remote enchanted forest, a relatively short walk encompassing a variety of ecosystems from subtropical forest to glacial peaks. We then continue our journey to Coyhaique. Cross back into Argentina and on to the famous Ruta 40 (Route 40), paralleling the remarkable Andean mountain range. Travelling south through the vast Patagonian plains we stop overnight at a remote Patagonian Estancia (ranch). Today we make a special visit to the Cueva de los Manos (Cave of the Hands), which is one of the most important archaeological sites in South America. The caves feature paintings that are the most ancient artistic expressions of the native people of the subcontinent. They were painted by the first settlers of these lands, ancestors of the Tehuelche people (or Patagones), and date back to 3300 years ago. It was declared as a UNESCO World heritage site in 1999. Enjoy the landscapes of the Patagonian Steppe as we head south.Further on we will arrive in El Chalten and the Los Glaciares National Park. The ice field here is the world's 3rd largest reserve of fresh water. Enjoy lodgings in the hotel, nestled quietly under the imposing peaks of Mount Fitzroy, named after the captain of the Beagle, who navigated Darwin's Expedition of the area in 1834. 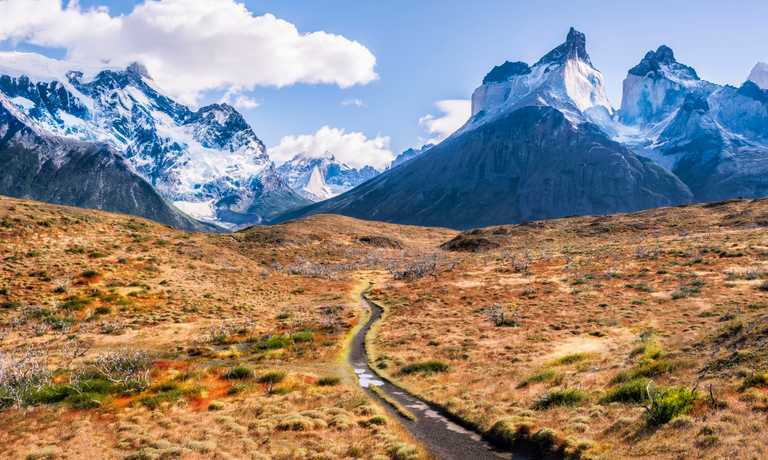 NOTE: This tour concludes with upon arrival in El Chalten, we recommend a minimum of one night post tour accommodation in El Chalten after finishing the tour. Alternatively continue south on our great Southern Explorer expedition. This trip joins with our Lake District Adventure and Southern Explorer tours, please enquire for more information. A 25% supplement applies to solo travellers who do not wish to share with another person.